This is College Physics Answers with Shaun Dychko. This boat with mass one times ten to the seven kilograms is moving in the positive direction say, and it's going to hit this pier, has an initial speed of 0.75 meters per second and hitting the pier will bring it to a stop within six meters. So our job is to find the net force exerted on the pier, but we're first going to calculate the net force on the boat because that's what this net force is here in this impulse formula. Net force times time equals the change in momentum of the boat and so we're going to be finding the net force on the boat. But that force on the boat will be the Newton's Third Law counterpart to the force on the pier. So we have the force net that I've written here could also be written as force on the boat due to the pier. That's the Newton's Third Law counterpart to this force on the pier due to the boat and this is what the question is asking us to find. 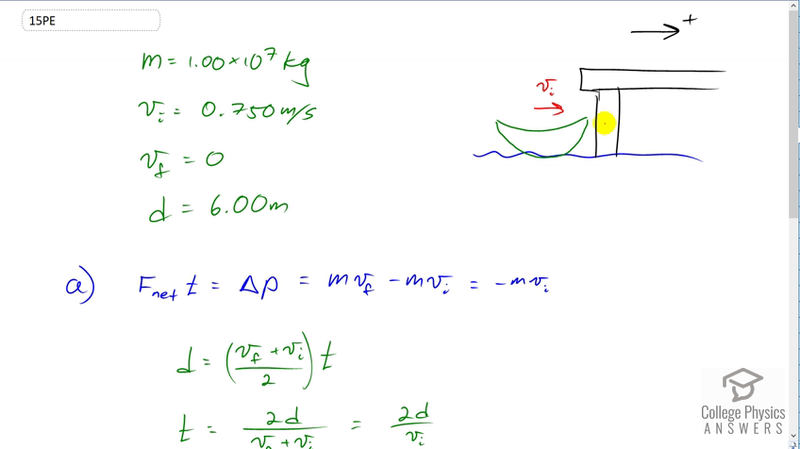 So we'll first find this and then we'll say that the force on the pier due to the boat is the negative of the force on the boat due to the pier because they're Newton's Third Law pairs. So the change of momentum is mass times final velocity minus mass times initial velocity, final velocity is zero, so we call this negative m vi. Then we have to find time to substitute into here in order to solve for F net. So we know that the displacement of the boat is going to equal its average velocity multiplied by the time it takes for it to come to a stop. This is final velocity plus initial velocity divided by two and we'll solve this for t by multiplying both sides by two over v F plus v i. Then t since v F is zero, t is going to be two d over v i. We'll substitute for that in place of t in this formula and we do that here. So F net times two d over v i equals negative m v i. Then we'll solve for F net by multiplying both sides by initial velocity over two times displacement and so we have the force is going to be negative mass of the boat times its initial velocity squared divided by two times the displacement over which it comes to a stop. So that's negative one times ten to the seven kilograms times 0.75 meters per second squared, divided by two times six meters which is negative 4.69 times ten to the five Newtons. The force on the pier due to the boat is the negative of the force on the boat due to the pier and this is the force on the boat due to the pier. So the negative of negative 4.69 is going to be positive 4.69 times ten to the five Newtons and the positive indicates that the force on the pier is in the same direction as the initial velocity of the boat.